Nowadays everywhere you can find drones buzzing around. Holy stone GPS FPV RC is another terrific drone by the manufacturer quadcopter. This drone has some awesome features that make this one of the best drones in the market. This HolyStone HS 100 drone has a built-in advanced GPS system. It will help you to enjoy your drone flying experience thoroughly. The GPS of this drone is the star, you can fly it anywhere without the fear of losing. It has one feature which I find very interesting and useful at the same time that is the emergency features. This is one of the biggest drones that I have ever tested. Its length /width 50cm and height 20cm,weight 700g with battery. It has loads of features. You might confuse its design with Phantom 4 pro. The body of this HolyStone HS 100 one of the best drones made of plastic cover with a black coating. The camera placed under the drone and plugs are from behind. You will get notifications from LEDs about the pairing, battery status and lock status of GPS. The blade guards are completely optional you can remove it to get better mobility of the drone. But it is a safe option for you if you are flying it for the first time. I can assure you that this drone has better build in quality. Now I will discuss its camera performance. I want to be totally honest with you in this review. Though this is one of the best drones of many that camera quality of this drone is not so impressive. You wouldn’t experience any wobble recordings which is the main reason for a poor video. But You might be little disappointed by the lack of sharpness of the video. Because the camera uses Wi-Fi technology. The holystone HS 100 doesn’t come with a good signal. That’s why it becomes tricky to get a good FPV video quality. The camera is electronically adjustable and wide view lens is a pro. By a scroll wheel on the transmitter, you can tilt the camera, which is a very good feature. You can save all the video recordings or images to a micro SD card which comes free with this drone. If this is your first drone and does not have much knowledge about flying. Then it has some features like blade guards to help you. That makes this is one of the best drones for you. There is the same button to get the drone up and also land it afterwards. The speed of this drone is adjustable which is obviously very helpful for the novice pilot. FPV is stable if it is within the range. It has a very responsive transmitter with the range 500m. If you go out of the range of the transmitter it will activate its GPS, for this your drone will come home safely. I believe this is a great feature from HolyStone. Although the WiFi FPV range is very short. The connection might cut off once you fly it beyond 150 meters. 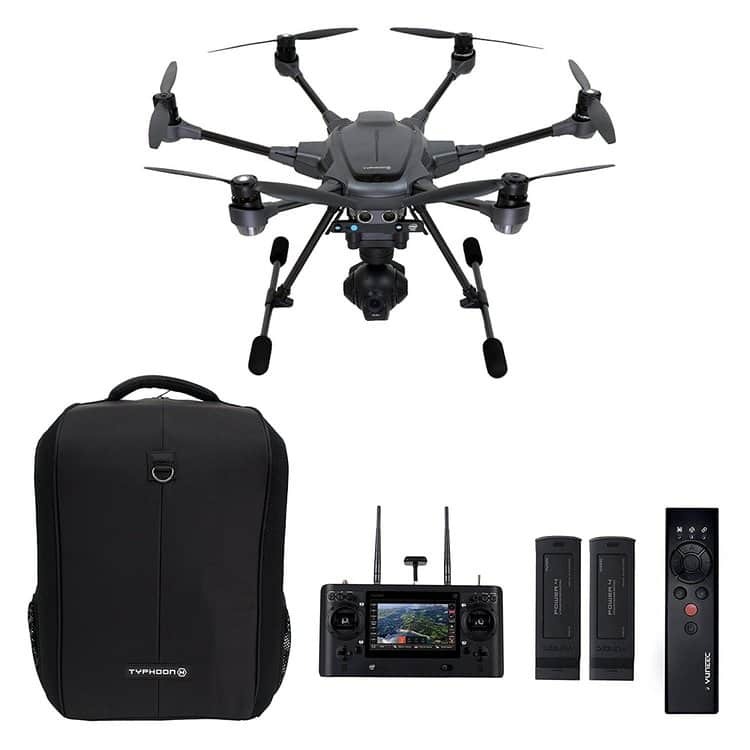 The capacity of the battery around 2500mAh.In this power, you can fly this HolyStone HS100 which is one of the best drones in 10-12 minutes. It takes 3-6 hours to charge the battery, which is the only problem I have with this drone. This drone uses brushless motors, that is very essential for the battery to be able to power to the motor for a smooth flight. There are a handy status LEDs which will notify you how much charge you have. I must tell you that it takes a very long time to get charged almost 6 hours. You will need a USB charging cable to recharge the battery. Other than that transmitter is very good quality. You might know that, what is the sign of a good transmitter. Yes, it’s the weight of the transmitter. And in this drone, the transmitter is very heavy. You will find three buttons under the joystick. These are to activate return home function, powering on the transmitter and altitude hold. On the left trigger section of the joystick there is a scroll wheel for adjusting speed, follow me and GPS tracking. On the right trigger section for adjusting camera tilt .taking photos and start video record. It comes with 2 buttons which are used to take photos and videos. Return Home Function: This feature can be activated by pressing a button. 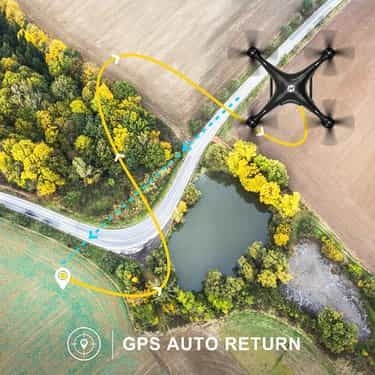 This mode uses GPS to return the drone to its starting point. This feature makes this drone one of the best drones in the market. Follow me Mood: This mode is when you want to film your running or riding. 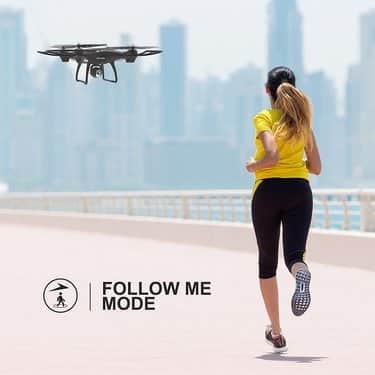 If you activate follow me mode then this drone will follow you like your bodyguard. The drone is forced to follow the transmitter after activating this mode. Adjustable speed: by this adjustable features you can adjust the speed of the drone. If you are not experienced enough in flying drone then you can take full advantage of this feature. Micro sd card slot: there is a micro sd card where you can save photos and videos. Headless Mode, Altitude hold & One key takeoff and landing features: This mode is actually for those who are new in piloting. This hold is also available and very useful. 4 glorious LED lights assist night flight: You can fly this drone at night with the help of bright LED lights. Emergency stop: this mode is for when you fly it out of the range. 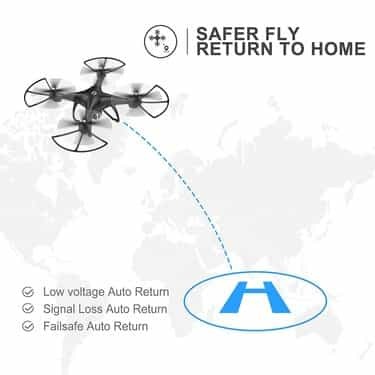 Then by this features your drone will get return home safely. 3D VR compatible: Click on VR icon to turn on the mobile phone split-screen mode. Then wear the VR glasses to experience the 3D visualization. 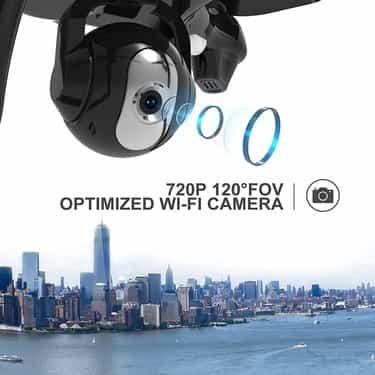 Ideal selfie drone: This HolyStone HS 100 is an ideal selfie drone, equipped with the high-quality camera and altitude function make it easier to take an aerial selfie. The great build in quality makes this holystone HS 100 one of the best drones. But the camera quality and lengthy charge time do not justify the price. I think you will feel the same. Now the question is would I recommend it or not? Yes, I do recommend you, but at the same time, I will suggest you have this drone on sale. We also hope that there would be some reduction in price. Then this will make this drone more logical purchase. All in all this drone is not lacking much. Its FPV mode, follow me mode and one key take-off mode, 15 -20 minutes of fly time and GPS features make it very popular among drone lovers. If you are a new flyer then this drone is the best option for you. Make sure to experience this drone and let us know your experience by commenting below. Thanks for the invention, HS100 is really amazing. I have just got one and the good thing about it is it’s stability. Return home mode am comfortable with that but am yet to try to activate follow me mode. It’s just new am still exploring. Another challenge indeed is the quality of the camera, but it’s not that bad because am able to appreciate the view. Am not able to get the whole manual book in English because the one I got together with drone is not in English. The one I downloaded could not display all the necessary information. Otherwise it’s really a good invention and amazing. Hi does it come with a case to keep it in. And what is the price in Rands? Yes Williams it,s coming with a case. Check up for the price.